Inspired by the legendary James Bond, OMEGA has created the "Commander’s Watch". The timepiece salutes the ensign colours of the British Royal Navy, with touches of white, blue and red creating a stately look. The 41 mm stainless steel case features a blue ceramic bezel with a Liquidmetal diving scale and red rubber covering the first 15 minutes. 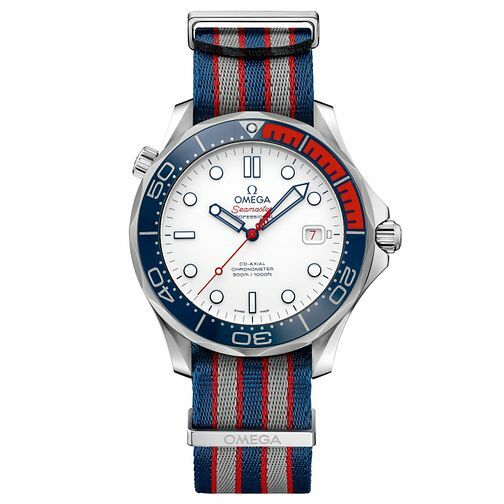 The NATO strap is blue, red and grey and follows a 5-stripe pattern with a polished buckle. Cased in stainless steel and with a polished white ceramic dial, it features facetted blued skeleton hour-minute hands and varnished red second hand with “007” gun logo counterweight and it's powered by the exclusive OMEGA Calibre 2507. The Commander's watch is limited to 7007 pieces. and is presented in a box inspired by a real medal case. The box also contains a stainless steel bracelet, a changing tool and a "naval pin" that mirrors the design of the NATO strap.